What an adventure it was to go to Nyetimber – especially for me as a proud French woman. 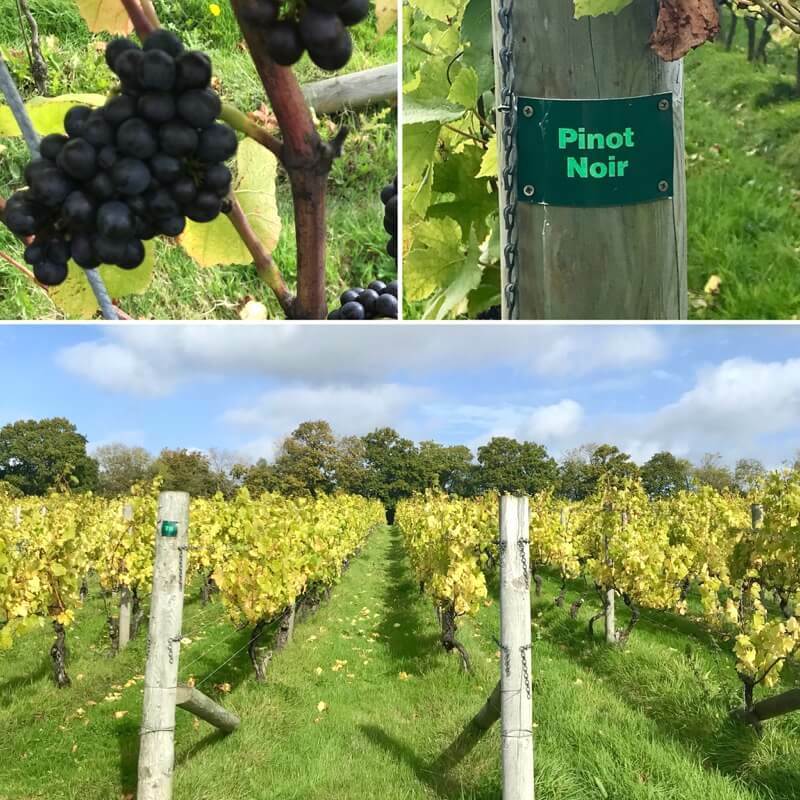 An unexpected and exciting opportunity to visit an English vineyard – and the prestigious Nyetimber Estate in Sussex was a great place to start! My adventure started at Victoria train station where we waited for our delayed train for Horsham (the South West Train service felt really similar to my dear SNCF). Thankfully I think my enthusiasm must have made time fly while we waited! From the left: The medieval barn, the fountain, the pond and the old manor. After just an hour on the train, we set foot in Sussex and drove through the impressive gates of Nyetimber and arrived at the vineyard where the very welcoming Anna and Steffan were expecting us. 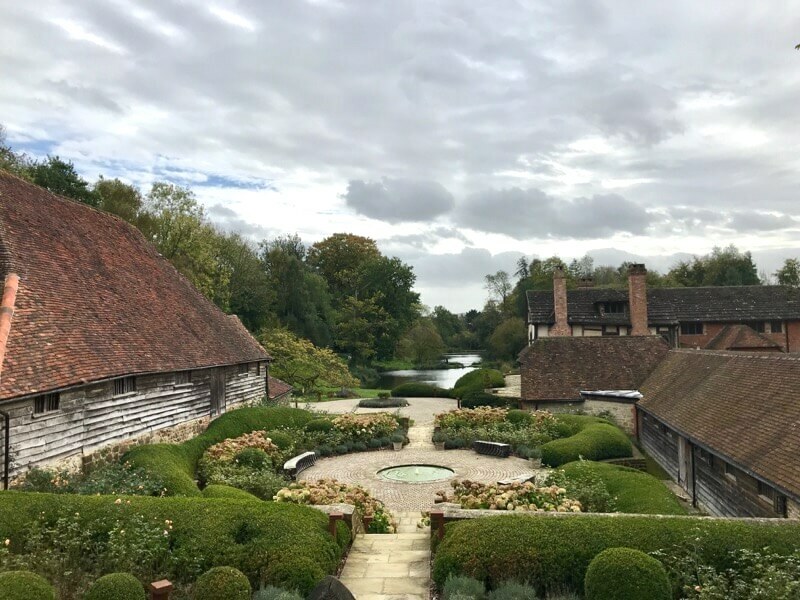 We were taken into their newly refurbished barn from which you had a wonderful view of the old manor house, its pond and the 15th century medieval barn. After a quick cup of coffee we started our little walk around the vineyard. 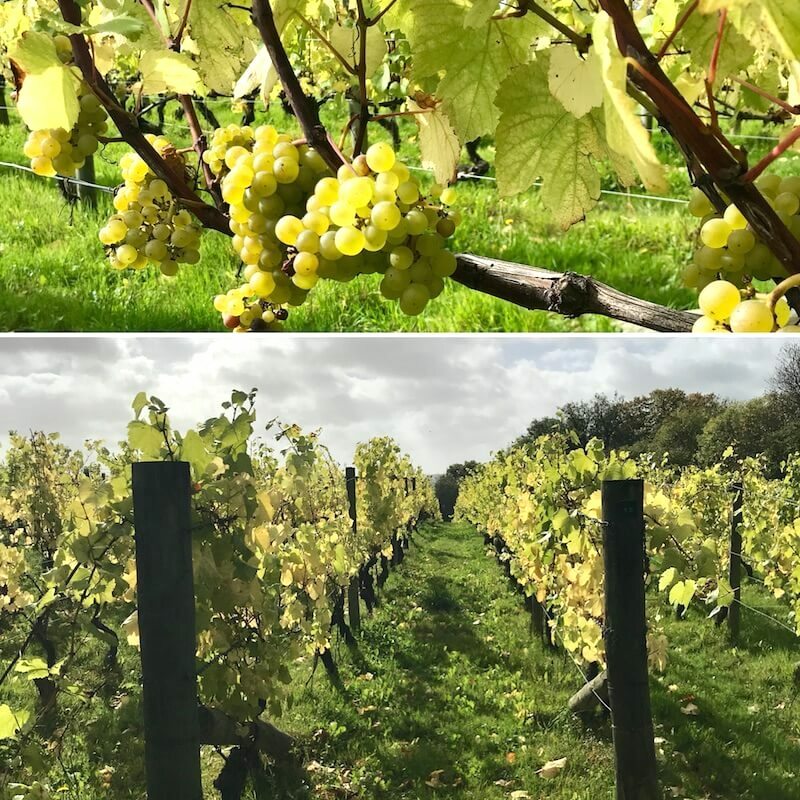 Discovering firstly the Chardonnay vines, some of the oldest in England, commercially speaking, on average these are 30 years old. The uniqueness of Nyetimber relies on the combination of its climate and its soil. The vineyard is surrounded by the South Down hills that shelter the vines from the wind and the rain from the sea which allow the grapes to reach the perfect level of ripeness. Moreover, the vineyards here are set on the same seam of chalk as in Champagne – world famous for its draining qualities. The icing on the cake of this outdoor walk was to be able to taste the grapes that were almost fully ripe, as we were there just one week before the beginning of the harvest. We had the chance to compare the concentration of old vine Pinot Noir berries with grapes from younger vines. Fascinating to see the clear difference with the juicer, zippier berries on the young vines, the different thickness of their skins and the amount of juice each contained. The little ramble into the vineyard and the ‘grapey’ picnic woke up our taste buds perfectly, now it was the time for tasting! Once again we felt spoiled to be here, having the table set for us in the beautiful barn with four sparkling wines to try : the Classic Cuvee Multi-vintage, the Classic Cuvee 2009, the Rosé and a sweet touch to finish with the demi-sec! The Classic Cuvée is the flagship of Nyetimber, they used to produced a vintage one but they decided to now create a multi-vintage cuvée – most commonly named Non-Vintage – to ensure the quality and taste of their ambassador wine! The 2009 Classic Cuvée is a special ‘late-release’, the difference is that it has now aged in their cellars for longer and it is from just a single year. Lea & Sandeman is one of the few to stock this mature gem! How lucky we are! If they were to be compared we could say that the multi-vintage shows yeast and green apple aromas rather than the 2009 vintage would be more into bread flavours, fresh melon and apricot. I really enjoyed the 2009. The Nyetimber Rosé has an iconic sunset-pink colour and delicious aromas of red fruits. 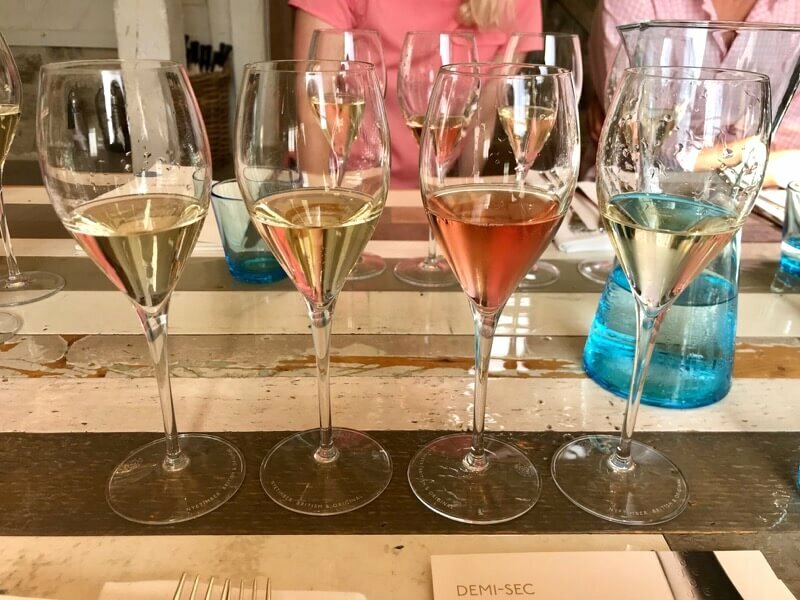 The last but not least of our little fizzy tasting was the Demi-Sec Multi-vintage, a pure Chardonnay. I have to admit, this one was my sweetheart of the tasting a perfect balance of sweetness, acidity and bubbles! Gourmand and refreshing! The final joy of our visit was the beautiful lunch with all the produce coming from a local farm, everything tastes amazing in Sussex! 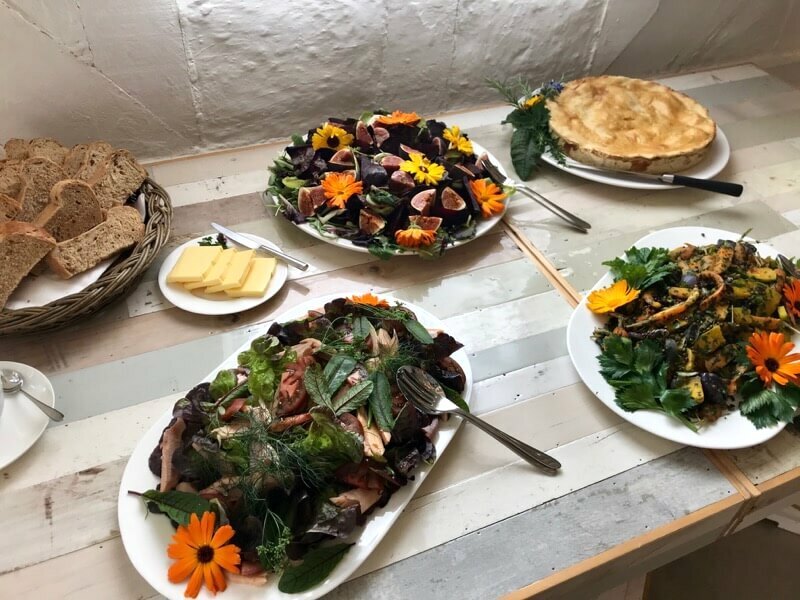 On the Menu: a delicious pie with some amazing fresh, seasonal salads (as in the pictures above) and to please my sweet tooth one of the best crumbles I have ever had, which paired beautifully with the Demi-Sec – heavenly! 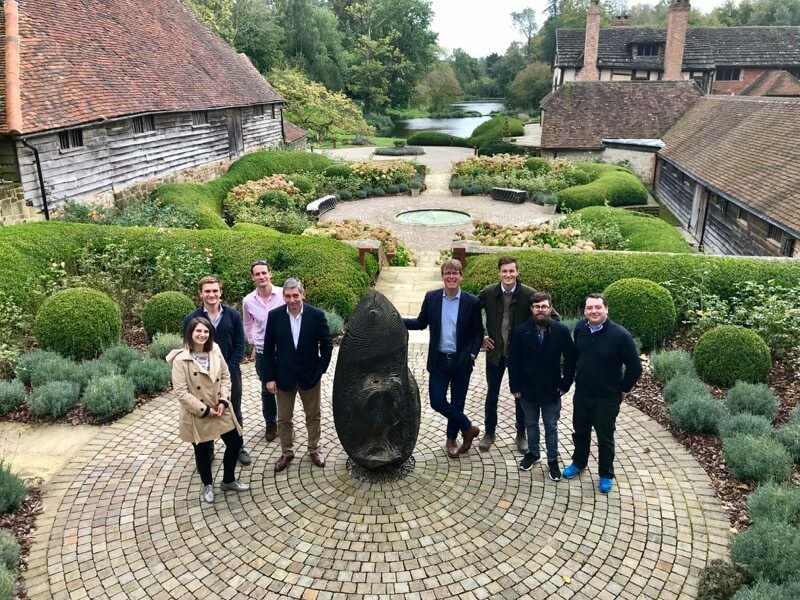 Visiting Nyetimber was really a great experience for me, in my life as both a wine professional and wine lover, and as a french person. In France (and almost everywhere) quality sparkling wines are meant to rhyme with Champagne, but Nyetimber is proving many of us wrong! It has talented and passionate winemakers (Cherie Spriggs and her husband Brad Greatrix), an ancient history and strong brand image for a winery that’s only 30 years old! It was also impressive to see how well the technical team has mastered the lands, learnt to understand the climate and to develop its know-how in less than 30 years.